Please feel free to hit us up with any questions or comments about our products and/or information posted on our website. We are 100% customer focused company, and will do anything within our abilities to please our customers. We will also take suggestions on how we can improve our products and services. 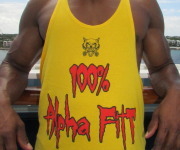 An ALPHA FITT customer is a valued member of the PACK. Therefore, your questions or comments (good or bad) are greatly appreciated.